A Merlin, or center point crystal, is a rare and powerful point - and this one has EIGHT faces, too: a tiny timelink and a true diamond window. 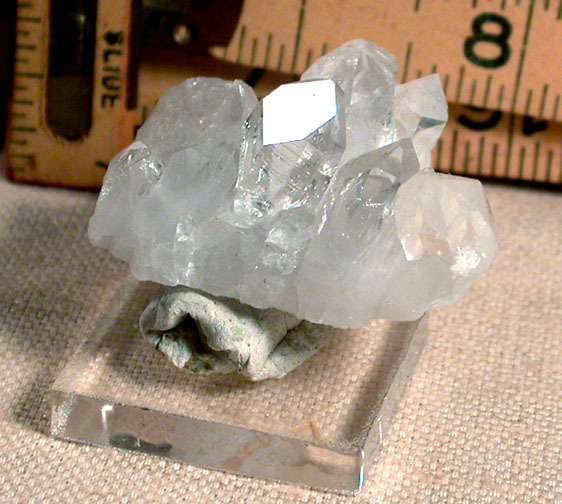 Not to be outdone, there are an uncommon and rainbowed tabular chisel crystal with 7h face and rainbows, and a tiny crystal towards the front with a large 7h face. 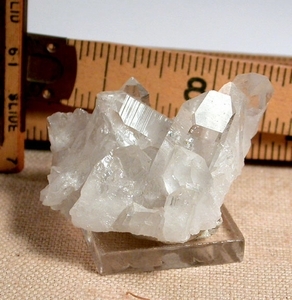 Glossy penetrated crystals, triplet crystals, two missing crystals, regrowth, and a flat plate bottom make this miniature a fine collectible - and a great reiki helper. 1-5/8"x 2"x 1" high.